� Casebeer and McGuire had two of their three main draw match wins of the 2013 season in St. Petersburg, including a come-from-behind three-set victory over fourth-seeded Ryan Doherty and Olympic Gold Medalist Todd Rogers. 2015: Casebeer played in six AVP events, one each with Montgomery and Jennings, and four times with Derek Olson. His best finish was seventh with Olson. He finished ranked fourth in aces per set (.74). Internationally he played six FIVB events with those same three partners, getting a best of ninth with Olson. 2014: Casebeer formed a partnership with Casey Jennings, getting a best of third in their six AVP events together. 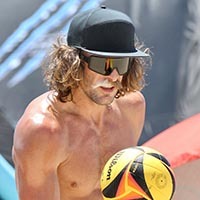 Casbeer played one AVP event with Will Montgomery. Casebeer was third on the Tour in blocks per set (1.83). Casebeer and Montgomery teamed up for four FIVB tournaments, with a best of fifth. 2013: Casebeer reunited with McGuire on the AVP Tour, playing six events with a best of seventh. They advanced from three qualifiers on the year, ending with a 10-2 mark in qualifiers. The pair ended as the 10th-ranked team on tour. If he had enough matches to qualify, Casebeer would have been second in aces per game (1.08). 2012: Casebeer formed a partnership with Will Montgomery, and the pair played in five domestic events together with a best of 17th twice. They played one AVP tournament together and lost in the qualifier. 2011: Did not compete in any beach volleyball events. 2010: Did not compete in any beach volleyball events. 2009: Casebeer and McGuire played in one AVP Young Guns event, finishing 13th. 2008: Casebeer made his pro beach volleyball debut at the age of 19 with an AVP qualifier with Andrew McGuire. That duo competed together in the FIVB U-21 World Championships in England, finishing ninth. College: Casebeer was a three-year letterwinner at UCLA. An outside hitter, he led the team his senior season in kills and was the Bruins' top passer. Personal: In 2012 Casebeer and Will Montgomery represented the U.S. in the World University Games. He has competed internationally on Australia's, New Zealand's and Turkey's national tours.